BLABBING: WE CANCERVIVE THIS ANNA... PLEASE REPOST..
WE CANCERVIVE THIS ANNA... PLEASE REPOST.. It was perhaps one of the most unstable emotional out bursts i had after knowing that My Friend Anna has it. Yes, my friend is suffering from Cancer. It was too painful for us, her friends, to accept that she has it. We went to the point of questioning God, why Anna? From the thousands of sinners of the city, why allow C to victimized such a wonderful person with no hatred in her heart but love and joy? If it was dreadful for us, it was excruciating for her mom and her family. She has been telling stories about her mom and her breakdowns from all the tests done. It was not easy for Anna see her mom dealing with her Cancer. But we support her. Before she was diagnosed to have it, her earlier diagnosis was myoma. She is going to have it removed or a total hysterectomy. Anna is a big fan of children. And with it, she’d love to bear a child and have her own. It was uneasy for her to accept it but "what the heck", she said.. "kung talagang hindi eh di wag.. It has to be removed but before operation she has to have clearance thats when the doctors found out about the tumors in the liver. After months of tests ,laboratories, ct scan, biopsy, 2nd opinion in the US, it was then when the doctor told her she has cancer, neuroendoctrine tumor in the pancreas which already metastasize in her liver. She was different from all the cancer victims I know. Never had she ever shed tears over her situation, but stand tall and strong against it. She didn’t know how to react when her doctor told her about her illness. We also deny it. To the point of celebrating it over pizza and pasta.. "Tara nga mga bakla, Shakeys tayo!" Her family never failed to support her. Her uncle said, "If there we cannot do anything about it, but fight for it. So instead of questioning God why Her?, we should use the time doing what is need to be done.. “And I agree. So Anna had her first Chemo and we were there. Anna is still on the battle against Cancer. Her family and her friends are there to support her with this battle. And we know Anna is strong enough to fight it. Go Anna! Today is her 29th birthday. She is not asking for any gift but prayer. She might be strong and tough but like any other individuals, she also needs help. Anna has to recover from it. Because the world needs her. Her family and her friends need her. And she is too young to give it up. And in behalf of Anna, we are asking everyone to please have a little time to ask God for her healing. A few minutes a day is enough to convince God, Anna has to stay. And as her friends, although she is not requesting anything from us... we are asking you to please help and support her by sharing your blessings. 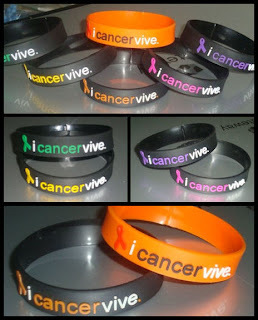 We are selling BALLER IDs tagged "i-cancervive". For a price of Php100.00, you can be a part of her battle against Cancer. The proceeds will be used for her chemotherapy and other medical procedures. Ask your friends and mates to support Anna by wearing one baller in each arm. Please be a great help to others. araxi rei xian is a catalog product description writer of an online car parts store. he loves writing about anything. he is fond of blabbing about anything..